Phaser is very expressive and beautiful effect. While it was very popular in 70-s - 80-s during 90-s it was unfairly forgotten. But during last years the phaser popularity grows very intensive. 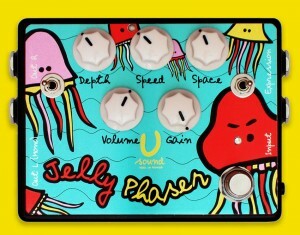 Thanks to U-Sound customers who persistently asked for Phaser pedal the "Jelly Phaser" was born. The depth of phase shifting is providing by 8 stages (instead 4 or 6 using by other manufacturers). Other special features of this pedal are: Gain and Volume controls, which make possible using send/return connection and use this pedal with keybords. Instead traditional Input/Output there is another one Output for stereo connection and another one Input for expression pedal (sells separately). 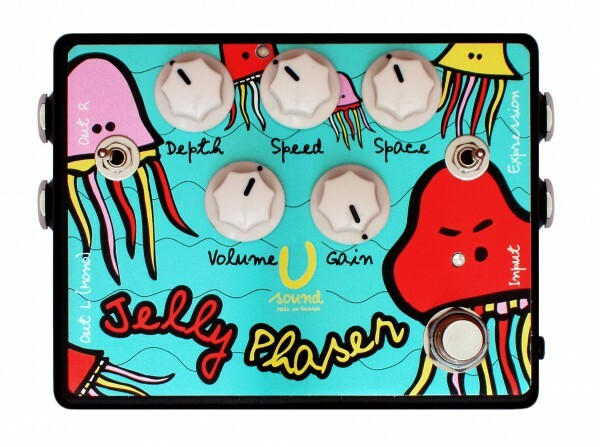 Only very high quality components are used in Jelly Phaser. It isn't noisy, compact and easy-to-use.